Dangers of Vaping: Can it harm your smile, gums & teeth? Vaping refers to the act of using an e-cigarette. It was first introduced to the market in 70’s, but it did not receive the recognition it has presently. Only recently, which has primarily transpired over the past few years, vaping has become increasingly popular. 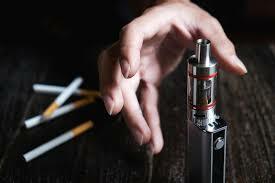 Many individuals, mainly younger people, find enjoyment in inhaling and exhaling the vapors that e-cigarettes produce. The addition of various flavors, as well as the experience, makes it appealing for vapers to engage. With its insurgency over the years, many individuals have questioned the dangers of vaping. As a deliverer of nicotine, the concern has been whether using an e-cigarette has the same effects on the body as smoking. Similarly, the oral health implications attached to nicotine users is also questionable for the use of e-cigarettes. The question that arises is: Can vaping harm your smile, gums, and teeth? Many individuals dismiss the importance of maintaining a healthy mouth. Far too often, improper oral hygiene results in decaying teeth, gum disease, and many other oral deficiencies. Poor oral health has been linked to heart disease and many other health-related issues such as cancer. With this in mind, finding out how vaping can play a detrimental role in your oral health is critical. Much like other parts of the body, the well being of your mouth is also fundamental to your overall health. So, keeping your gums and teeth in excellent condition is critical. One of the unpleasant habits that dentists wish for their patients to dismiss is smoking. Tobacco is a harmful drug that can have long-term effects on your oral health. Smoking and especially chewing tobacco can increase a person’s chance of acquiring severe oral cancer. Additionally, gum disease, tooth decay, stains, tooth loss, disfigurement of taste buds, loss of taste and smell as well as a number of their adverse factors can result. Many are unaware of the detrimental impact smoking can cause to their mouth. How Do The Dangers of Vaping Compare? Due to the commonality of smoke that is emitted from traditional cigarettes and e-cigarettes, the assumption held is that vaping delivers the same negative effects as smoking. However, although this is true in some regard, there is a distinction. Nicotine, which is heavily found in cigarettes, and is mostly responsible for the adverse health issues attached to smoking, can also be found in some e-cigarettes, but not all. There lies the the main dangers of vaping, the nicotine. Nicotine has been confirmed to impair proper blood flow to the gums and as a result, deprives the gums of oxygen and crucial nutrients. With this impairment, gums are subjected to decay. Gingivitis and periodontal disease can also result from excessive exposure to nicotine. Increased muscle activity, due to nicotine’s stimulating nature, can prompt teeth grinders to engage excessively in this action. Over time, tooth sensitivity, loss of teeth, broken teeth, damages to the bone structure and other consequences can result from grinding teeth persistently. Despite the presence of nicotine in some e-cigarettes, many argue that it is less harmful than traditional cigarettes, but there are still dangers of vaping. However, despite this claim, individuals should consider periodical check-ups with their dentist. Doing so will keep you attuned to your oral health. However, to avoid the setbacks that can arise with the use of nicotine, considering e-cigarettes that are absent of nicotine is the best solution. Whether you are engaging in vaping or not, pay attention to our oral health. At GPS Dental, Dr. Gary Skrobanek and his expert team are committed to helping our clients maintain the well being of their mouths. Consider contacting our team of friendly personnel to assist you with your dental needs.